I was feeling a bit rough when I arrived at the finca to work this morning, I put it down to a case of man-flu, and battled on. 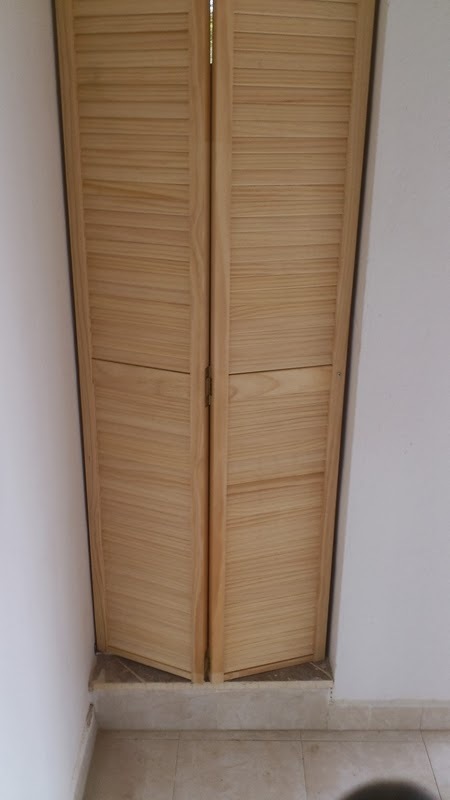 The shower rooms upstairs are a pain in the backside, the entrance to them, is too small for a standard door, and I thought I had resolved this by buying a louvred closet door, no frame required, a bit of trimming, and away we go... wrong!! The door was 2m, and the space 1.86m once the rail was in, however the width of the door is described as 600mm, but it is actually 610mm and more with the space between the fold. I cut the doors down to size, but this left very little support for the louvres, and the width makes it a complete non starter. So having spent half a day on the door, it is now a temporary fixture, to give some privacy, until I can come up with something else. I think we can safely say a 'Fail'! I then fitted the bathroom cabinet, by this time I was really rough, but it was only 3pm, and there was much to be done. 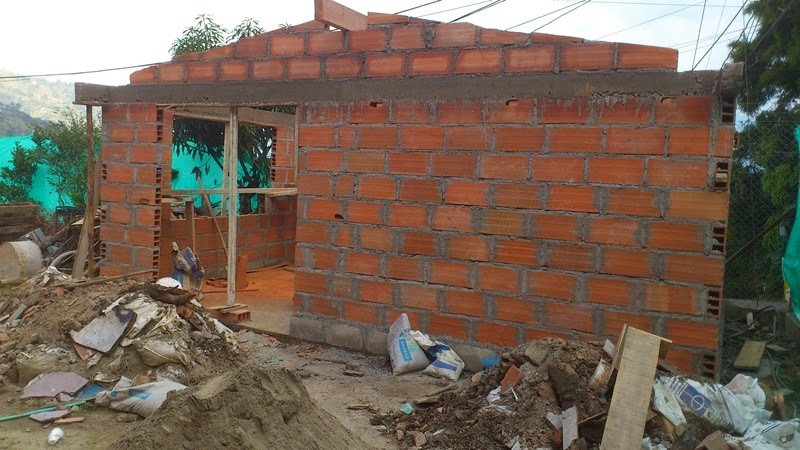 I started scrubbing our bedroom floor with thinners, John and Ramillo had stopped work on the workshop, it was too hot, and they were felting and tiling the clothes drying area at the side of the house. They must have smelled me, because both of them came up to the bedroom, and told me to stop, apparently the thinners here is extremely toxic, a paper mask is not sufficient, you need a respirator, and it smells vile. John said they would sort out the floors tomorrow, and to get off home. By this time, I had heart burn, as well as a sore throat, and was starting to think that I was not safe to drive, but somehow I made it home, and went straight to bed. Marcela was talking Doctors, I just wanted rest, and plenty of water, I had a mug of milk before going up, in case poison was the case, but by 7pm, I was feeling a little bit better, and came down for supper. I'll have to be more careful, especially as our new Health Service Provider, SURA, is playing silly buggers. With the previous company, I paid for a complimentary insurance plan, which gave me instant access to Specialists, and if I went into Hospital, my own room, I had applied for the same with SURA, and was assured that I would have the cover, only for the Assessor to contact Marcela today, to say, someone higher up, was saying that they would only give me the Plan, if Marcela switched to it as well, at the moment she has a Policy with the Insurance Company she worked with, she knows her Specialists, and has no wish to change. What they are asking is illegal, and amounts to blackmail, to get more commission, so for the moment I only have basic health cover, and will have to wait for any appointment needed along with the general populous. Hopefully I will be fit enough to return to work in the morning, the workshop, has jumped ahead again, and weather allowing, they may well at least get all the purlins in place.